Historically, we’ve seen a huge number of people who have either had some half broken default firewall installed by their distro, or, have installed one themselves after a random google search returns (often terrible) advice. This almost always causes many more problems than it solves. These firewalls usually default to being massively over enthusiastic and block large chunks of needed traffic, or, they require constant hand-holding and fiddling to keep them working. This tends to cause people to give up and turn them off, or open them far too wide – either because it was TOO configurable, or, not configurable at all without understanding raw iptables rules and memorizing the periodic table backwards! Firewalls can (and often do!) have a large number of nerd-friendly knobs and buttons to twiddle. But I wanted to make this as simple and easy for our users as possible, so I worked hard to constrain my ‘Add a button!’ desires. This means that there’s probably not as much configuration as you expect to see in a firewall – EXACTLY what I wanted to achieve! Find a secure but usable way to automatically detect legitimate remote users who don’t have static IP addresses but need access, and make it easy for them to get to the services and phone access they need while safely blocking everything else out there (I've coined this the Responsive Firewall, more on this below!). However, because this firewall is deeply integrated at a very low level of your system, it can be far more intelligent than a normal firewall. 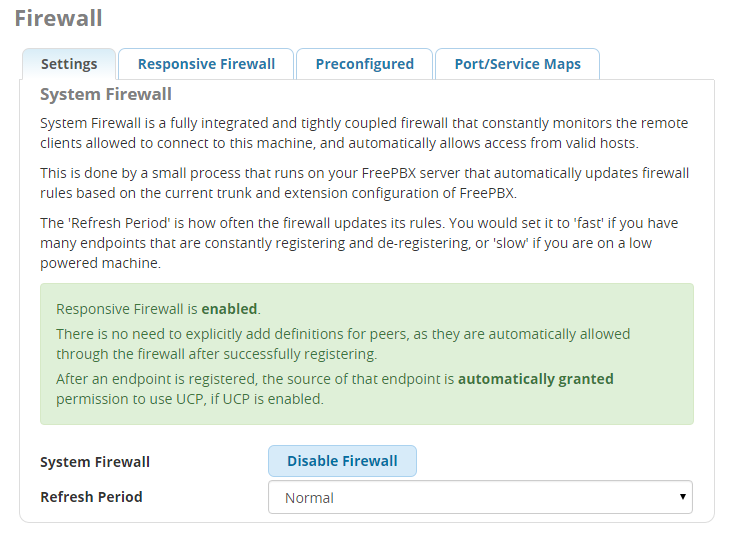 If you’re familiar with firewall concepts, you’ll, of course, see the standard things you expect from a modern firewall, such as zones, network interface configurations, and lists of services (such as SIP, SSH, HTTPS and so on…) Those are all important capabilities in a firewall and are there to allow more advanced configuration by advanced users. Of course, it would be wonderful if everyone always used a VPN when away from the office – and, in fact, we’ve put a lot of work into enabling that capability with the new VPN module (more on that to come, but that topic will be left for a future blog). For the rest of us, there’s the Responsive Firewall. 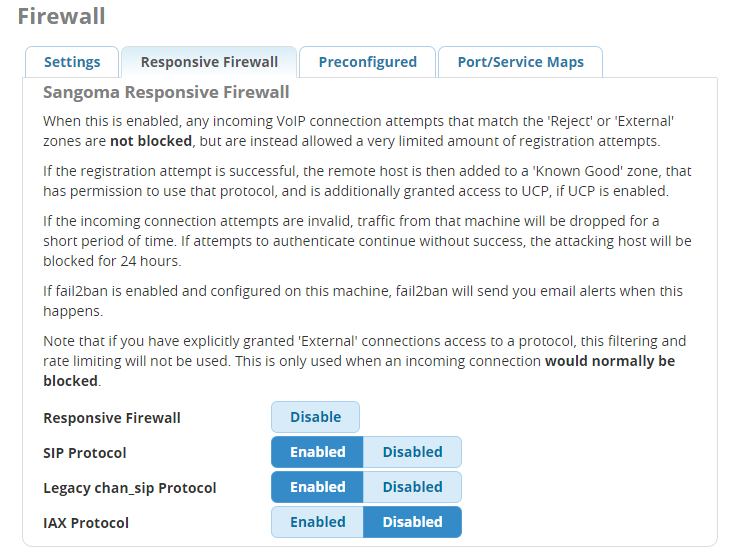 If you enable Responsive Firewall and expose the selected protocols (SIP or IAX), the firewall will actively validate clients that are trying to connect to the machine on the selected port(s). This is somewhat similar to what fail2ban does, but fail2ban is passive, banning an ip by looking at logs only after too many failed attempts. No, not until you upgrade to FreePBX 13. It’s almost impossible for me to backport it to 12.